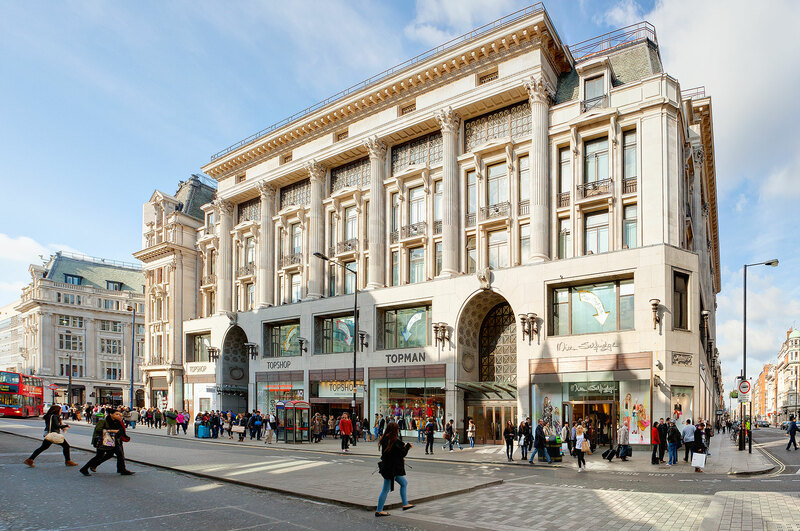 Due to the huge footfall and heavy traffic at Oxford Circus, Thomann-Hanry® cleaned the Topshop flagship store entirely at night using platforms, which were removed before the onset of rush hour traffic each morning. The building where the Topshop flagship store is located is at the northeastern quadrant of Oxford Circus. It was designed in 1912 by Sir Henry Tanner as a symmetrical composition with the other three quadrant blocks framing the circus and completed in 1923, with the eastern extension taken in the following year 1924. The Portland stone façade is in Classical style with Beaux Arts details and more neo-Grec features to Hall and on the latest extension. Thomann-Hanry® have cleaned the facades using façade gommage®, which does not require the need for scaffolding. Other works of stone restoration also took place, and the whole project was finished in two days only, with minimum disruption to pedestrians, occupants and the store’s trade.